Swrve is delighted to announce the availability of our Intent Engine. Using the Intent Engine, it is now possible to build incredibly sophisticated and granular audiences, based on essentially any combination of events, defined with any combination of recency and frequency criteria, and all based on real-time information from any relevant channel. We’ve all come to expect relevance from our day-to-day interactions, whether they are digital or in person. From movies suggested by Netflix, to a curated newsfeed on Facebook and travel apps that remember which flights you were looking at last week, we rely on the fact that our apps know us like our friends do: even better, actually, since apps will never forget our birthdays. What all this boils down to is that interacting with people as individuals is far more effective than firing out the same message to anyone and everyone. However, traditional audience building can be pretty simplistic: User A has done Action A, so will be sent Message A. The reality is that this simply doesn’t reflect the full picture. Swrve’s new Intent Engine employs an unlimited number of customer intelligence elements obtained in real-time across multiple channels, combined in any way and based on any chosen frequency and recency criteria. It allows you to know your customers like never before, and to convert every person's every action and behavior into real-time customer intent. By using multiple levels of behavioural information, across multiple channels, Swrve is now able to create hyper-specific segments of users who are most likely to engage with a proposed interaction. What’s new about intent targeting? Quite simply, it provides more context and more information than any segmentation or audience building engine before. Most targeting usually takes the form of something along the lines of Example A below - simple, single level, and ultimately resulting in a customer grouping that narrows users a little, but not a lot. What it really amounts to is showing who completed a certain action in the past, rather than predicting who is intending to complete a certain action in the future. Example B, however, is an example of the kind of precise segmentation that is just a few clicks away with Swrve’s Intent Engine. 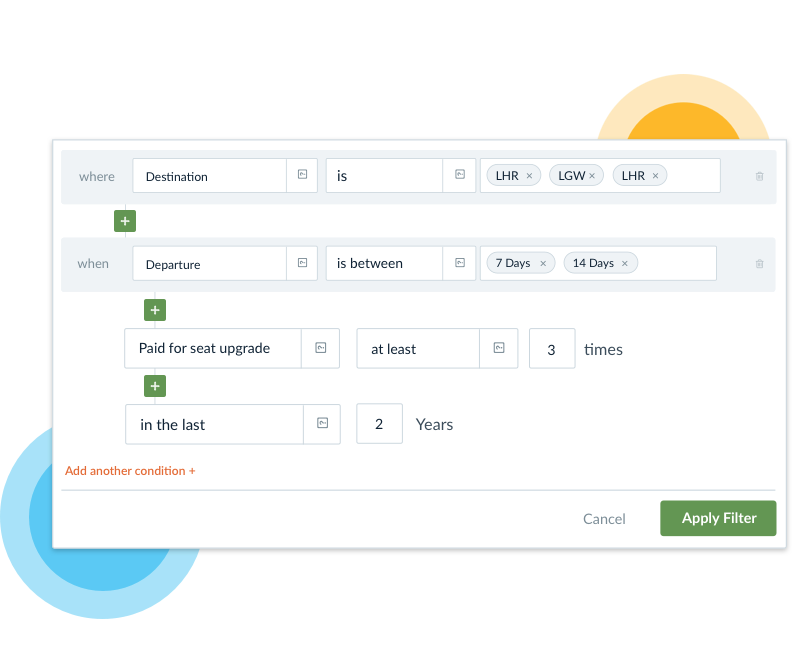 The system is able to filter not only by searching multiple airports but also previous purchase behavior, each with independent recency and frequency criteria. This example broadens the analysis from people who have ever searched for a flight to San Francisco, to those who are in the process of actively planning a trip to California, and therefore are more likely to take action in the near future. It then folds in likely customers based on prior behavior to deliver a more accurate and meaningful target group. Swrve helps marketers capture 'Audiences With The Greatest Intent' and convert them with personalized customer interactions. Our message to Joe below is a simple notification, but by presenting him with an offer on the flights we know he’s been planning to book, Joe is more likely to book his tickets with BelAir. In order to produce this level of detail, the Swrve Intent Engine collects billions of events per day relating to user activity, from any relevant channel. It then provides a streamlined and straightforward dashboard that enables complex queries to be put together quickly and easily. As the example below shows, multiple conditions can be added at the touch of a button, and thanks to dynamic fields and auto-fill implementing effective multi-level targeting as seen in the example below takes moments. The number and nature of the data fields is completely changeable to suit the needs of each organization: the Intent Engine supports queries of infinite complexity, and there are no limits to the recency and frequency criteria that can be employed. The Intent Engine is also designed to draw data from across interaction channels, including mobile and desktop internet and SMS, and can integrate with third party systems, using insights from existing marketing stacks and inventories. From service messages to re-engagement, on-boarding to conversion, intent targeting can bring benefits to every type of customer interaction with apps. 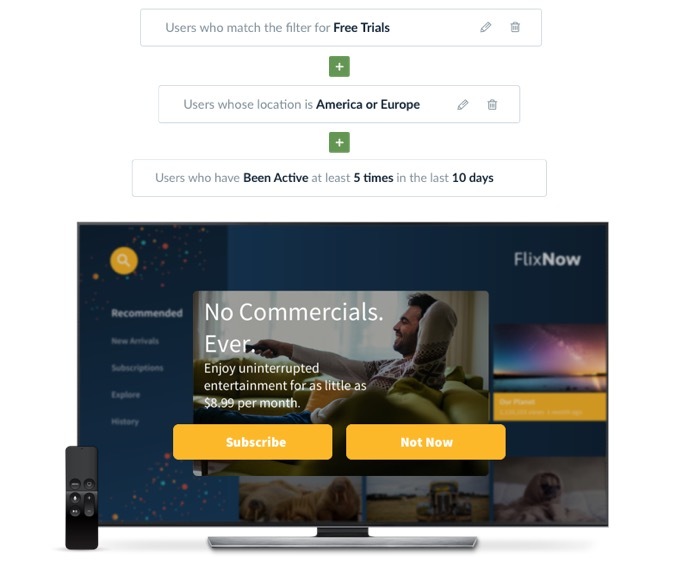 For most media organizations, for example, getting free users to convert to paid subscriptions is number one on their wish list. To make sure that you target those who are at the ideal point for conversion - and don’t annoy those who aren’t - the Intent Engine can be used to select the right people based on real-time interactions (and then send them the right campaigns). Since the dashboard interacts with a range of channels, intent targeting can be used to generate interactions that reach free service users through native mobile app campaigns, rich push notifications, email, SMS or digital media streaming platforms. As the simple example below shows, specifying a moderate level of recent user engagement indicates that these individuals are likely to engage with an upgrade suggestion. Users whose recent engagement has been falling, for instance, would be best approached in a different way - perhaps with a nudge highlighting new content - to prevent them from leaving entirely. Filtering by location enables the messaging to be designed to suit local culture, again increasing the chances of engagement. The bottom line is that intent targeting matters to your organization’s bottom line. By using unlimited combinations of real-time behavioural data to target rather than simply triggering messages, the degree of accuracy your campaigns achieve is greatly increased - and that’s before you take into account the ease and speed of being able to do all of this in-house and before lunch. Interested to find out more? Get in touch with a member of the Swrve team to find out what our Intent Engine can do for your business.